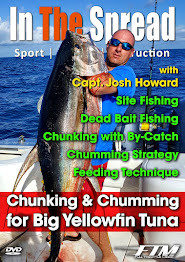 Steve Waters from the Sun-Sentinel says, "the In the Spread with RJ Boyle DVD offers keys to daytime swordfishing success. He goes on the write, Boyle freely shares his tactics with anglers at seminars and at RJ Boyle Studio, his Lighthouse Point tackle store and art gallery. Between his store, his artwork, his seminars, his fishing and time with his family, Boyle has a hectic schedule. So he decided to record everything he knows about swordfishing in the DVD "Daytime Swordfishing." "Having a tackle store and doing seminars, we're constantly bombarded with so many questions because daytime swordfishing is very technical," said Boyle, who has done daytiming seminars from Texas to New York. "It's very difficult to teach numerous customers at numerous times of the day about daytime swordfishing. Making the DVD was something we really had to do." Boyle and producer Seth Horne of Full Throttle Media did a great job with "Daytime Swordfishing." Thanks Steve for the fine article and your honest review of what the Full Throttle Media team and RJ Boyle have produced, thus far.